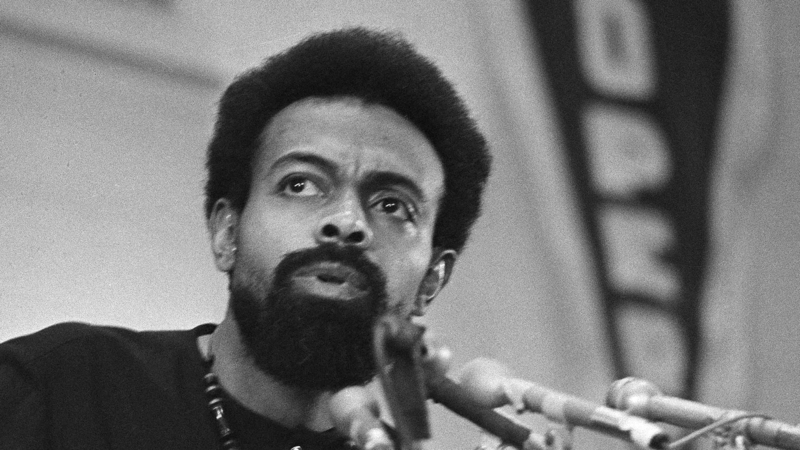 Amiri Baraka, shown here in 1972, was a renowned poet whose politics strongly shaped his work. One of America's most important — and controversial — literary figures, Amiri Baraka, died on Thursday from complications after surgery following a long illness, according to his oldest son. Baraka was 79. Baraka co-founded the Black Arts Movement of the 1960s. His literary legacy is as complicated as the times he lived through, from his childhood — where he recalled not being allowed to enter a segregated library — to the 2001 attack on the World Trade Center. His poem about that attack, "Somebody Blew Up America," quickly became infamous. The poem had immediate consequences. Baraka was reviled even by former fans, and his post as the official state poet laureate of New Jersey was dissolved. A few years later, the host of the NPR show News and Notes pressed him about the incident, asking if he had any regrets. "No — I have regrets that they didn't pay me my money — cheap criminals. I have regrets about that," Baraka said. "But I don't have regrets about writing the poem. Because the poem was true." 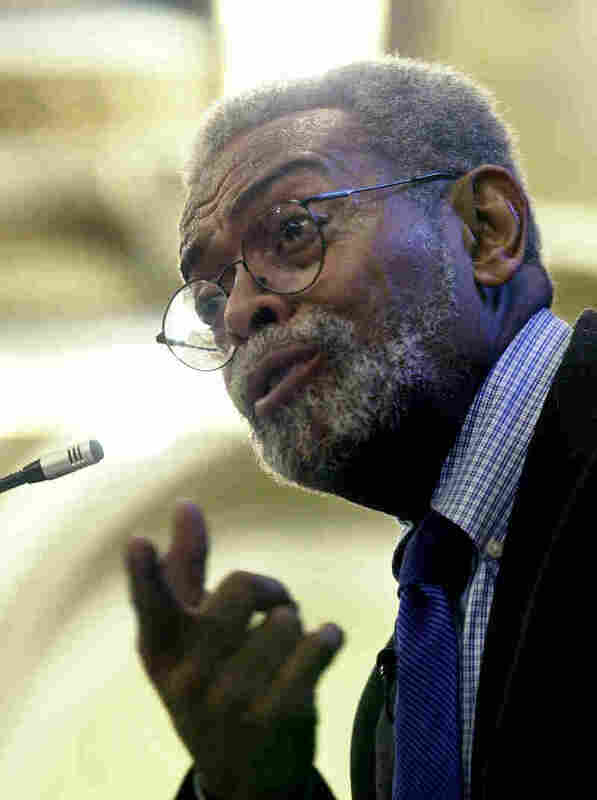 In 2002, Amiri Baraka faced criticism of his poem "Somebody Blew Up America," which led to the removal of his position as state poet laureate of New Jersey. I wanted to look like that too — that green shirt and rolled up sleeves on Milestones ... always wanted to look like that. And be able to play "On Green Dolphin Street" or "Autumn Leaves" ... That gorgeous chilling sweet sound. That's the music you wanted playing when you was coming into a joint, or just looking up at the sky with your baby by your side, that mixture of America and them changes, them blue African magic chants. As a young man, the writer was part of New York's then-mostly white Bohemian community. He hung out with Allen Ginsburg and Jack Kerouac — and wrote a book called Blues People that changed people's ideas about the importance of African American culture, says scholar Kumozie Woodard. "I think the Blues People might be his signature work. And that introduced jazz studies to the American academy," Woodard says. Then, in 1964, the writer still known as LeRoi Jones wrote a play, The Dutchman, which won a prestigious Obie award and established the playwright as a literary star. It's set on a subway train, where a beautiful white woman strikes up a conversation with a young black man — and begins to tease him mercilessly. "You look like you live in New Jersey with your parents and are trying to grow a beard. That's what. You look like you've been reading Chinese poetry," she says. But the teases become taunts, and the interaction grows ugly. Eventually, she stabs him in the heart. The play, said critics, expressed deep hostility towards women — a charge that followed the playwright for much of his life. After the murder of Malcolm X, he left his white wife and two daughters to live by radical black nationalist ideals. He described it on NPR in 2007: "In the '60s, after Malcolm's death, black artists met and decided we were gonna move into Harlem and bring our art, the most advanced art by black artists, into the community." The Black Arts movement was a basically a counterpart to Black Power, and Baraka wrote a number of books now seen as foundational for a certain kind of black aesthetic and cultural identity. He converted to Islam, changed his name and in the 1970s, turned towards Marxism. His work would always emphasize social and political issues: "The people's struggle influences art, and the most sensitive artists pick that up and reflect that," he said. Baraka's work galvanized generations of younger artists, even as his stridency alienated him from the mainstream. But he managed to work in both worlds. He was a full professor for decades at SUNY Stony Brook, and he was recognized by the Guggenheim Foundation and the National Endowment for the Arts. At the same time, he ran a community arts center in Newark with his second wife. Professor Kumozie Woodard says all these roles — teacher, activist, artist, leader — came together as soon as you walked into Baraka's front door. "One time I came to his house and there was all this noise downstairs, and I asked him what it was, and he said it was a group of junior high school students who had a jazz history class downstairs," Woodard says. "And then I heard noise upstairs, and I said, 'What's that?" and he said, 'Well, the kids have taken over my office, and they have a newspaper.' "
In Baraka's house — and throughout his life — the Black Arts Movement never stopped. A previous headline did not accurately reflect the story's content.